When was the last time that someone complimented you on your choice of eyewear or just noticed that you had made a change? Selecting the right style and making sure that it fits your face both cosmetically and for comfortability are traits of a well-trained optician. We excel at finding the right frame and offering the best lenses and lens options, all at the right price. Stop by Bundy Opticians today and browse our extensive inventory. We offer exquisite frames, handmade one at a time by the finest artisans. Select from top designers and even decide whether you want frames made of colorful acetates (plastic frames), lightweight titanium, or durable stainless steel. Frames for business, wardrobe, hobbies, and all athletics are on display, so come in today. We look forward to helping you with your decision. What is Blue Light? Sunlight is made up of red, orange, yellow, green, blue, indigo and violet light. When combined, it becomes the white light we see. Each of these has a different energy and wavelength. Rays on the red end have longer wavelengths and less energy. On the other end, blue rays have shorter wavelengths and more energy. Light that looks white can have a large blue component, which can expose the eye to a higher amount of wavelength from the blue end of the spectrum. We also carry Easytwist children’s frames! "I have been coming to Bundy's for more than ten years. Started with a quick nose pad replacement. The customer service was so sincere and pr..."
"They are incredible, Mr. Bundy is a stand out guy. Very timely and professional, he sticks to his word and gets RESULTS. Highly recommend, g..."
"It's been six weeks or so since receiving my new glasses from Bundy Opticians and I could not be happier with them. I am seeing so much bett..."
"Wow! Even Nordstrom could learn a tip here and there from Gerry Bundy. 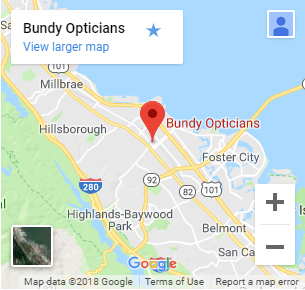 I came in directly from ANOTHER optometrist's office that had not tak..."
"I have used Bundy Opticians for more than a few years. Quality of work? Superb ! Staff knowledge? The best! Customer service? Awesome! I hav..."